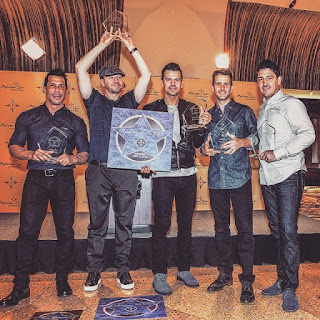 Donnie was interviewed on KTU with Cubby & Carolina to talk about the NKOTB and more. Listen below! Students from the Sensory Arts Program at the Joseph Lee School in Dorchester put together a 105,000 tile mosaic to celebrate the 30th anniversary of NKOTB. Check out the time-lapse video below and a photo of the finished product. There will also be a news story about it on 5 o'clock news tonight on WBZ channel 4 in Boston. 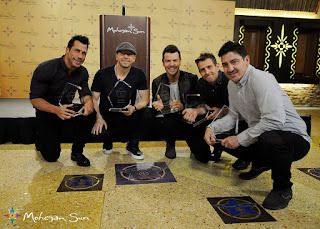 The New Kids on the Block got a "star" in Mohegan Sun Walk of Fame on yesterday and they had a brief induction ceremony before the show. NKOTB will be making an appearance at an after-party at the Vision Bar Sands Bethlehem Event Center show on Thursday. According to the Radio station 100.7 WLEV, It says "To Get into the After Party, all you need is a ticket to the 6/11 show". They also have a few options to win tickets to the concert here. When New Kids on the Block finishes its show at Sands Bethlehem Event Center on Thursday, the group will still be “Hangin’ Tough” at an after-party at the venue, the Sands has announced. The event center’s Vision Bar and Bethlehem radio station WLEV-FM 100.7 will host an after-party that will include an appearance by the group. To get into the after-party, you must have a ticket to the show. At the after-party, a pair of suite-level tickets to New Kids’ sold-out show Saturday at the event center and a meet-and-greet with the band will be given away. Lehigh Valley DJ Cap Cee will provide music. Tickets to Thursday’s show are $69.50 and available at www.sandseventcenter.com, www.ticketmaster.com or 800-745-3000. WLEV also is running contests to win tickets to Thursday’s show. You can sign up at www.wlevradio.com, “like” WLEV on Facebook and/or follow it on Twitter, or text "KIDS" to 68683 (standard message rates apply). The deadline for all entries is 11:59 p.m. today. Cap Cee also will open the show. Danny posted a new behind the scenes video about his life. It shows Danny in his home and he talks about Remember Betty, working out, his new solo record and more. Check it out below! That may be a testament to young female fans’ undying devotion to their boy bands, even as both groups age. New Kids members are now 42 to 46 years old. New Kids singer Joey McIntyre points out that interest has continued seven years since the group reunited in 2008. That, McIntyre says, is validation that the group has continued to make good music and put on good shows. He’s referring to the two discs the group has released since re-forming after a 14-year break. “The Block,” released in 2008, hit No. 2 and had a Top 40 single, “Summertime.” The follow-up “10” in 2013 peaked at No. 6. In a call this week from a tour stop in Charlotte, N.C., McIntyre spoke about New Kids on the Blocks’ past, its current tour, and its future. LEHIGH VALLEY MUSIC: Hey Joe, how’s it going? Just fine, thanks. So let me jump right into this: How did you guys end up touring with Nelly and TLC? “Um, well, I think it started [when] we did something called the MixTape festival [in Hershey, Pa.], which we’re doing again this year. TLC was there and we hadn’t seen them in a while, but we listened to them back in the day when they first came on the scene and we were huge fans of them back in the day. You know, girls loved them, guys loved them, they really kind of broke the mold. They were so fresh and new and out there. And so we were big fans. And then to see them doing their thing again was really cool, so we thought out fans would – obviously they loved their music and all the hit records that they have, and they were doing their thing again. So we thought that was a pretty good fit. “And then Nelly kind of came up because – well, first of all, he’s at the top of the list. To be able to have an artist with again, six, seven hit records and someone who really brings it and is an entertainer, we just thought that was a good way to kick off the night. Let me ask what your shows are like these days. Obviously you’ve been around a while now and the fans from your initial popularity are the same age as you, probably – mid-40s. What kind of audiences do you see? “Well, I think our fans are more – age is just a number. But I think they’re, like, more average in their late 30s. “Cause our fans were so young back in the day, which was tough. Because we appreciated the fans – we had some young fans back in the day – 5-, 6-, 7-,8-year-olds, you know? But yeah, the heart and soul of our audience is the fans that were there back in the day. “But we’ve been back together again for seven years now, and as far as our shows go, we embrace the past, we embrace the nostalgia, but we also made new music. And we’re still young, thanks to being so young, again, back in the day. And we’ve been able to, I think, straddle, walk the line, between nostalgia and being current and cool and fresh. And that’s the spirit of the night. “But when it comes down to it, we’re entertainers. Since the day we got together when we were teenagers, it was all about ‘What’s the next show?’ ‘How are we going to surprise them?’ ‘Howe are we going to win over this crowd?’ ‘Cause we didn’t come on the scene having millions of fans – we earned it. And we played for a lot of tough audiences and we loved winning them over. Yeah, I got to tell you, I saw you guys the last time you came through Philadelphia, and here’s what struck me: It’s almost like you guys these days are sort of like The Temptations. You’ve got that music that people hear and like after generations. I think it’s able to see you guys as a vocal group, as a multi-generational vocal group, rather than just a boy band. You feel that at all? “Absolutely. It’s all, I think, again, when you’re in the business long enough, you don’t get hung up on labels. Again, we’re a boy band, they say we’re the original boy band, yada, yada, yada. We’re a singing group, we’re a performing group. “It’s funny you said that, ‘cause when you asked me the question I was just thinking, ‘The old-school entertainer.’ And certainly we have echoes of that – especially in the night we pay homage to the band that, without saying it, but bands like The Temptations and The Jackson 5. And I love those moments, because they’re timeless, and it’s almost like we’re carrying a torch, you know? “And I think – not to sound old fashioned – but I don’t see these groups coming up appreciating that. And I just think that’s a sign of the times. I remember [laughs] seeing something Frank Sinatra saying, like, ‘I hope someone comes along and sings these songs and carries the torch.’ You know what I mean? So I probably sound like him in a different genre, but I think that’s a craft. I mean, dancing, singing, performing – the whole package – is what we bring. What had kept you guys together so long? And do you see any end to it? “Well, you know, it’s important to mention first off that we took 14 years off. [Laughs] You know what I mean? And that’s a huge part of the equation. I think it was the first time around we hung in there for a little bit but we read the tea leaves. We also knew we had to have our own lives. We had been going and going and going for four, five years non-stop. And we wanted to see what was on the other side of the rainbow. “So we lived life, we made our mistakes, we grew up, we had families. And that’s what our fans did, too. You know, the fan base went away because it was human nature – that’s what we do. And then you get old enough and you go back, and you’re able to embrace the past. And those moments, and that time in your life becomes so sweet. “And so that’s a huge part of the equation. The other part is that I guess we never sold each other out. We never dragged any member over the coals for anything. We kind of kept our mouths shut and knew we were all in it together – whether we got back together or not. “And so when we were able to come back and say, ‘Well, maybe let’s try this,’ we were all willing to do it together. We were all willing to fail. Because after 15 years, you don’t know who’s going to come out, who’s going to come back. What’s going to happen. “And the fans were ready. We were ready and the fans were ready, and they showed up. And it’s magic. It’s a miracle, it’s magic. It doesn’t happen; it really doesn’t happen. And right now, because of the commitment that we made to each other, we benefited from the experience. There’s nothing like experience, no matter what you do. Years of experience. “And so many groups don’t benefit from that because they break up and they move on, for whatever reason – good, bad or indifferent. We’re lucky enough to be back together, and the more we’re together, the more we know how to work together and live together and appreciate every moment. And we’re just getting better and better at it. “So will it ever end? I don’t think it will ever end in the sense that we’ll always be New Kids on the Block. And we’ll always have our fans. And as our fans get older they’re always going to mean something to us. I mean, frankly, fans are going through stuff in our lives now that is not easy – they have lives, they’re getting sick. I mean, some of them are, unfortunately, suffering from different diseases. And we’re losing a couple of our sisters. And that’s life. When your authorized biography, “Five Brothers and a Million Sisters” came out a couple years ago, there was an anecdote in there about you guys starting your first headlining tour, and you started it in Allentown, Pennsylvania at a roller-skating rink. Do you have any recollection of that at all? “Yes. I believe I do, yeah. I believe I do. It was the first night we had a live band. We used to, when we first got our break opening for Tiffany, we would literally just get a cassette and sing over the cassette. That’s all we could afford, you know? It was advertised as the first date – in 1999. Donnie was interviewed on "A Few Good Minutes" hosted by Joel Idelson. He talks about his getting movie roles in the 90's after the New Kids broke up and more. Florida Today interviewed Joey about the tour, embarrassing moments, motivation, his plans for after the tour and more. Friday night, the New Kids on the Block step into the ring as the Main Event tour stops at the Amway Center in Orlando. The tour, which also features special guests TLC and Nelly, kicked off in May and features a 360-degree stage allowing for optimal viewing without obstructions. 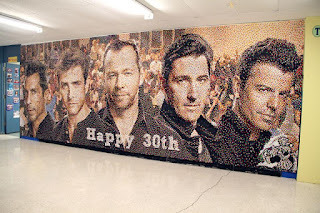 Consisting of Jordan and Jonathan Knight, Joey McIntyre, Donnie Wahlberg and Danny Wood, NKOTB started in the mid-1980s, and by the end of the decade the guys became international superstars. Considered one of the original "boy bands," the guys disbanded in 1994, yet the group is among the world's best-selling bands of all time, having sold more than 80 million records worldwide. Reformed in 2008, the band continues to record and tour in front of sellout crowds around the globe. QUESTION: How different is your approach to touring now than it was when you first started as a child back in the '80s? ANSWER: In some ways, it hasn't changed at all, and in other ways it has changed a lot. The spirit, excitement, drive and passion for what we do, and for what I do, is still the same. We still look forward to the next show and with experience we try to figure out what we are going to do different and how are we going to surprise our audiences. We all have a fever for what we do and have been doing for over 27 years. We have the foresight and awareness now to bring our show to a different level every time. Q: With the dynamics of the family always changing, do you think it'll hold you back from going to a national level? A: Wow, there are too many. I think my fondest memory for right now has been the last few weeks. We all get along so well, and I don't have to knock on wood after saying that either. To be able to do a show with four other guys that you have known your whole life and who mean so much to you is a privilege. Because we are such close friends and we have the best fans in the world, it is an honor to take the stage with these guys. A: I could say that I don't believe anything is embarrassing and you learn from it, but there have been some. My most embarrassing was probably before I even joined the band. I was like 6 or 7 years old and I was performing with the Neighborhood Children's Theater of Boston. We were doing a patriotic show and in the beginning we were wearing red shirts and blue jeans, and over it I had on this soldier type outfit. We were doing a platoon song and as I was marching I began to march right out of my pants and I didn't realize it because I had been wearing jeans underneath. I finally got what people were pointing at. You know, in this business you have to be willing to make mistakes, though, and you can't be afraid of them. Sometimes I try to hit a note I might not be able to hit and sometimes it doesn't come out the way I want it to, but you have to challenge yourself, and see where it takes you. Q: Does the band intend to record a new studio album once the tour ends? A: We have talked about it. It is a big endeavor, and these days it takes quite a commitment. We were blessed that our first album after getting back together was so successful and the album we released in 2013 still feels fresh to us. I wouldn't doubt if we do another, but right now we have only talked about it. Q: NKOTB started the boy band craze and the merchandising that went along with it. What was the craziest thing that used your image? A: I would have to say a marble with my face on it. To see your head go rolling down the hallway is a little surreal and doesn't do you justice. There was a lot of crazy stuff and it kind of got away from us where we couldn't put a cap on it. Q: What are your personal plans once the tour ends? A: I have a TV project in the works that I hope we can move on, but not sure yet. I have been lucky to have been on "The McCarthys" (on CBS), which, although it got canceled, averaged nearly 7 million viewers a night. I am open to new projects and I have a few things in the works. Q: Why do you think the band still captivates audiences more than 30 years after its debut? A: I think it is the gratitude we have for the fans. We really love what we do and the shows would not be possible without the fans. The legacy of our fans keeps us going. We are lucky to have stuck around this long and with that much time behind you it feeds itself. We still go out there and give 150 percent of ourselves in each and every show we perform. Q: What is your biggest motivation to perform these days? A: I think just the motivation to see what I can do next. I want to see how far I can push myself, grow and be in the moment. It is a privilege to do this and to be in front of an audience. I feel blessed for what I have.